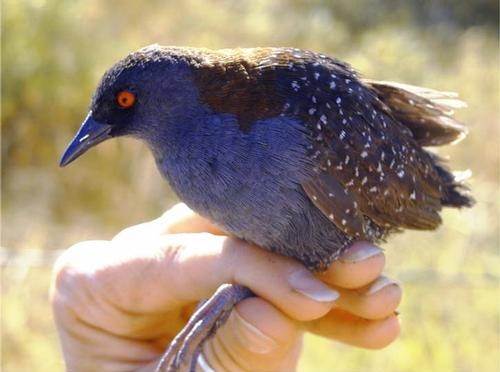 The California black rail is heard but rarely seen. While Californians are tightening their pipes to conserve water during this fourth year of drought, the California black rail might say, “Let it leak,” if it could speak. The rare bird species makes its home in marshes created in large part by leaky pipes, stock ponds, irrigation tailwater and unlined canals. Even the springs that support some habitat may rely on water flowing from leaky canals. In 1994, UC Agriculture and Natural Resources scientists found the small, red-eyed bird with the black breast and speckled black feathers at UC ANR's Sierra Foothill Research and Extension Center. 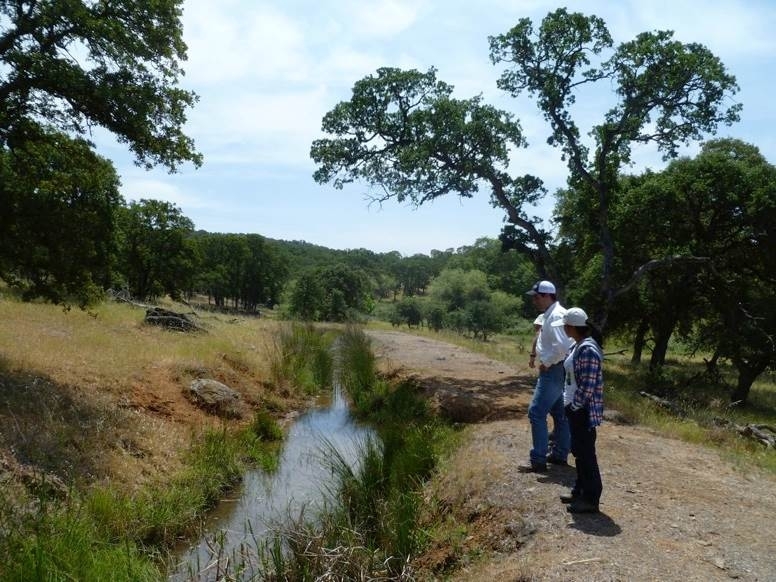 Since its discovery, a group of scientists have been exploring the effects of water management and climate change on the bird in Sutter, Butte and Yuba counties. California black rails, which can be heard more often than seen, largely depend on humans and irrigated agriculture to provide the shallow flowing water they use for habitat. Accidental wetlands created by leaky pipes and ponds are habitat for the black rail habitat. Because most of the rangeland in the area is privately held, and includes irrigated pasture for livestock, Lynn Huntsinger, professor in the Department of Environmental Science, Policy and Management at UC Berkeley, wondered if property owners would be willing to maintain wetlands to support wildlife. With the help of UC ANR Cooperative Extension advisors Glenn Nader and Roger Ingram, Huntsinger conducted a survey of 1,000 landowners in the three counties. Property owners responding to the survey said the primary reason for maintaining ponds and wetlands is to reduce wildfire risk, but they also like the birds and wildlife that are attracted by wet areas. However, Huntsinger worries that the “accidental wetlands” may dry up as the drought increases the pressure on people to conserve water by fixing leaks and replacing canals built during the 19th century Gold Rush with pipes. Most of the farmers and ranchers buy water from a water district so Huntsinger sees working with water districts as a key to the sustainability of wetlands for wildlife. 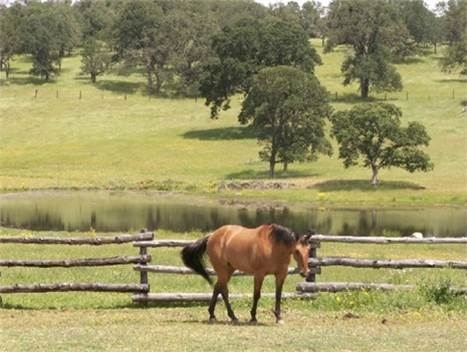 Property owners favor ponds to protect against wildfire and to support wildlife. “Water is going to be more expensive and harder to access given the trends in weather and population demand,” she said. To predict how long landowners will continue to maintain wetlands if water prices rise, Huntsinger is working with Jose Oviedo, an environmental economist in Spain. More and more, she says, it seems that we are facing tradeoffs between “goods”— saving water is good and preserving wildlife habitat is good. “We need flexibility and adaptation rather than all or nothing choices. After all, we are creating the future landscape of California,” Huntsinger said. Huntsinger's study is just one facet of a California black rail study that involves scientists with different kinds of expertise. Steve Beissinger, professor in the Department of Environmental Science, Policy and Management at UC Berkeley, has been studying black rail behavior for years and continues to monitor how many sites in the Sierra foothills the small birds use as habitat. Canals at the UC ANR Sierra Foothill Research & Extension date back to the Gold Rush days. Norman Miller, a Lawrence Berkeley Laboratory hydrologist, is developing models to understand the water dynamics and sustainability of the wetlands habitat. Marm Kilpatrick, assistant professor in the Department of Ecology and Evolutionary Biology at UC Santa Cruz, studies how concern about mosquito-borne West Nile virus may affect landowners' decisions to maintain wetlands. 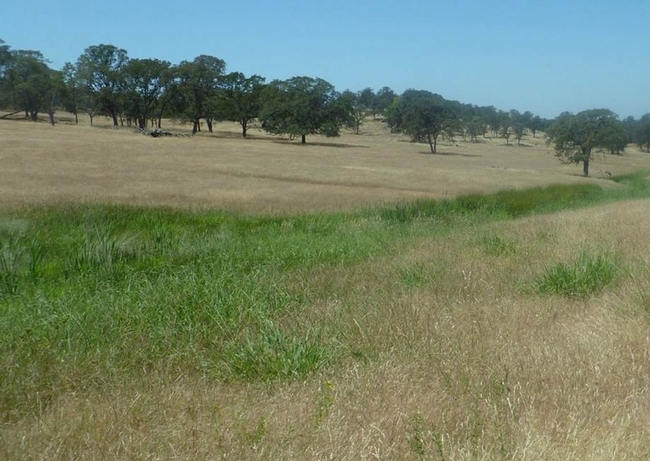 Below, UC Berkeley graduate student Nathan Van Schmidt describes research at UC Sierra Foothill Research and Extension Center on how the rails cope with drought, seasonal hydrology regimes, and the rescue effect. About 50 ranchers gathered this week in Willows to learn how they can convert straw left over from the rice harvest into a palatable and nutritious feed for cattle, reported Tim Hearden in Capital Press. 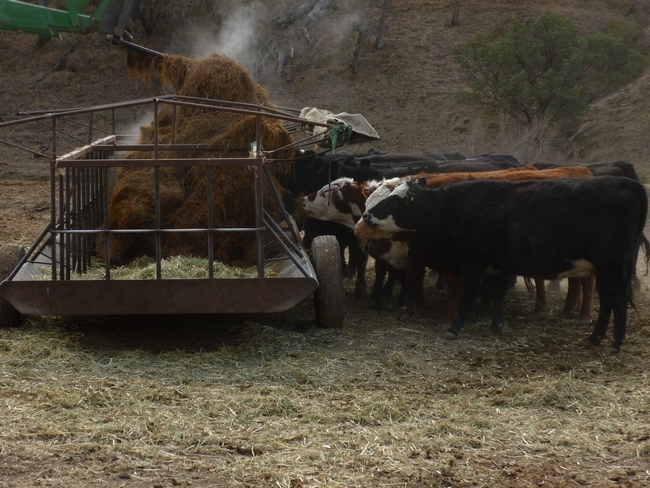 By baling rice straw before it dries and tarping it to keep the straw moist until it is fed to cattle, the feed, called "strawlage," is comparable to low-quality alfalfa, UC Cooperative Extension scientists say. “We haven't figured everything out, but with the drought conditions as serious as they are, we feel the time is right to share our research with growers,” said Glenn Nader, the UCCE advisor who organized the field day. Because of the drought, "There's going to be a significant problem with feed coming into this winter and rice strawlage may be an answer," said Peter Robinson, a UCCE specialist in the Department of Animal Science at Davis. The feed can turn black and become a little slimy, but the cows don't seem to mind. For more information, see the UC Rice Project website. Cows attacking rice strawlage as tractor drops into feeder. Today's rainfall doesn't put an end to drought worries. A storm is dropping some much-needed moisture in California today, but the drought drags on. 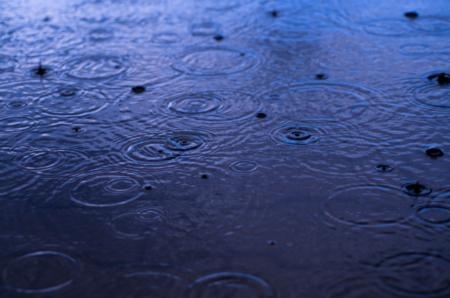 Using UC sources, the media has been reporting on the effect of a prolonged rainless period this winter and well-below-average rainfall the last three years. A story in the Los Angeles Times this week opened with the concerns of cattle ranchers. Without winter rain rangeland grass doesn't grow. Ranchers must decide whether to buy expensive feed or cull their herds to weather the drought. "Their struggle is a bellwether for California's $45 billion agriculture sector," wrote reporter David Pierson. The repercussions will be felt beyond the state's borders. "The Golden State produces nearly half of all U.S.-grown fruits, nuts and vegetables and is the nation's leading dairy and wine producer." Pierson quoted Doug Parker, director of the UC California Institute for Water Resources, in his article. "The agriculture industry is definitely hit the hardest by drought," Parker said. "In California, agriculture uses 80 percent of water in the state. It's a major input for their business and hits their finances and employment directly." The San Luis Obispo Tribune reported on drought hardships for SLO County fruit and vegetable farmers. Growers are facing increasing irrigation costs and taking steps to reduce salt buildup in the soil. In Stanislaus County, ranchers are expressing concerns about a trend among farmers toward planting almonds, reported the The Modesto Bee. 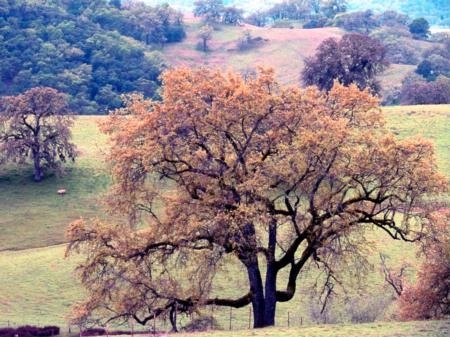 Ranchers are worried the spread of almonds, walnuts an other high-value crops could strain their limited groundwater, drive up land prices and intrude on their way of life. It was Duncan who provided the rough figures on almond profitability during the first day of the ninth annual summit of the California rangeland Conservation Coalition recently, wrote Bee reporter John Holland. Duncan said the net is even better for walnuts, which are not as extensive but still have had major growth in acreage. He also said the nut boom could be limited by a shortage of water and land. The Drovers Cattle Network reported that cattle ranchers are seeking strategies for surviving the drought. According to the article, rancher Billy McDonald's wife, Aileen, said she learned from UC Cooperative Extension farm advisor Glenn Nader that "you need to set a date, like if it doesn't rain by a certain date, to start culling. That's really important." Also as part of the story, Roger Ingram, UCCE advisor in Placer and Nevada counties, advised ranchers to develop a drought plan. Ingram warned against overgrazing and emphasized the importance of leaving enough residual dry matter in the ground to enhance seed germination and minimize soil erosion. With more bare ground, water would run off instead of soaking in, he said, and there would be less organic matter to feed soil microbes, resulting in fields being overrun by undesirable plants such as medusahead and yellow starthistle.